Lightroom 5 has been released... see the announcement at Adobe. There's a bunch of new stuff.... a good place to start your own investigation is Victoria Bampton's “What's New in Lightroom 5” and “What's New in Lightroom 5.0 Beta” articles. Also, Sean over at Lightroom Blog is keeping a list of tutorial/review links. The most exciting new things for me are “Smart Previews” (I can work with my entire 130k library of images on my disk-starved laptop), “Upright” perspective correction in Develop, where I can easily correct for my bad habit of not holding the camera level, and the new advanced healing brush, to paint away things you don't want in the image. I also like the new True Full Screen mode. One thing I don't like is a very dangerous Publish-related bug that remains in the final 5.0, that can cause you to delete your master images without even realizing it! UPDATE (Oct 25): Possible workaround discovered: see here. The problem is that the selection shown in a Publish Grid may not be the actual set of selected images, and so when you intend to perform operations (update metadata, delete images, export, etc.) on what you see as the selected images, it might not happen... a completely different set of images may be affected (updated, deleted, exported). Notice how the selection appears differently between Grid and the Filmstrip? The selection shown in Filmstrip is the actual selection... it's the selection shown in Grid that this bug causes to sometimes be wrong. In the example above, the two water-polo shots of my 10-year-old son are shown as selected in the Filmstrip, and they are the ones that any operations will actually act on, yet in Grid, six unrelated images are shown as selected. They are not actually selected, and invoked operations will not act on them. 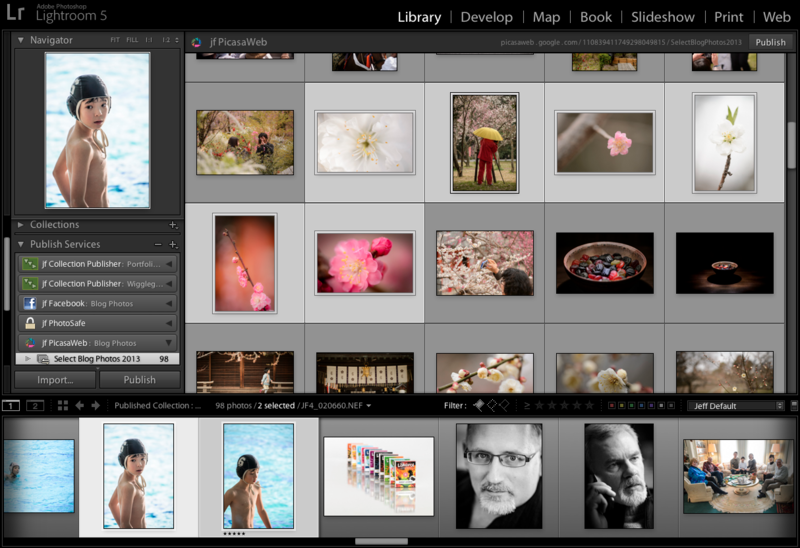 In Lr5, never select images in Grid in a Publish Service. Even using the next-image arrow key does not properly update the true selection, though it does update in Grid, making you think everything is working fine. It's a very dangerous bug. It's best to avoid working in Grid in Publish until this is fixed, but if you must, be sure to do so with the Filmstrip also open, and use the Filmstrip to make and identity selections. Noticed this behavior in the beta, was hoping it were fixed before the release – its a serious bug. Hoping Adobe releases an update soon. I’m noticing that this bug happens not only in the Publish module, but also when selecting images to develop in the Develop module. I have to select them in the filmstrip. Major bug, IMO. Hope it gets fixed soon. Jeffrey wrote “I think it’s not fair to say that they don’t care about quality…”. Just to be clear, when I said they don’t “give much heed to s/w quality” I didn’t mean to suggest Adobe doesn’t care about s/w quality. Its just that it is apparent some vendors seem to care more about quality and/or have a more advanced process that will provide a better quality product than other vendors. Let’s just say Adobe, with the LR product, doesn’t appear to be a leader in this regard! On the other hand I’ve been a long time PS user and that product seems very good. I’m not sure what version you guys are using are what specific route you are taking to find this bug, but I’ve tried it on mine and find no such thing. I’m using Lightroom 5, Mac OS X, 64 bit. I tried selecting files and gone to develop module. I’ve also done the same thing while attempting to upload via Flickr. In both instances, the files I selected matched what was displayed both in the grid and filmstrip. Perhaps a detailed documentation of your steps could help someone from Adobe re-create the error and fix it. That’s a bad one. Thanks so much for posting, Jeffrey. Highly appreciate it. i select images in LR and send them to PS. i edit them in PS and close them. then i swicth back to LR and select different photos and “try” to send them to PS… instead the SAME images i selected before (and are now unselected) are send over to PS. happend a few times in the past days. i forget to add.. this happens in the LIBRARY VIEW!!! I just installed LR5 and came to your site because LR5 told me that your Zenfolio and Facebook plugins needed updating. I’m glad I decided not to wait. Nothing I’ve read hinted at this as a potential error. I’m building my wife’s art portfolio and could have had disastrous results if I deleted images of artworks sold many years ago. Thank you Jeffrey for sharing These bugs with us. I have seen this Problem myself on LR5 and that’s a bit sad that Adobe released a final with that many bugs. I have a registered plugin to use Jeffrey Friedl’s “Export to Facebook”. My problem is the plugin WILL NOT connect me to my “Facebook Fan Page”. 1. I have another Lightroom friend, we sat down together at his Apple OS, did all the same steps that I had did and done. His Jeffrey Friedl’s plugin works flawlessly and beautifully allow him to export directly from his Lightroom 4 into his photography Facebook Fan Page. 2. Both his and my Fan Page reside inside each of our regular Facebook Pages. I guess I am saying we each have only one Facebook account. 4. Jeffrey is there something hidden or buried inside my Lightroom settings or in my Apple Library for Lightroom that I need to remove. Or do I need to reset something with my Fan Page. 5. I need your help, please! Open for all the suggestions and angles you want to give to me. I have also had a problem in the publish part of the Lightroom 5 beta. If I tried to delete a photo which was selected to publish but had not yet been published, old photos which were previously published would delete ( I don’t know if I lost the originals). Also, I had inadvertantly selected a psd to publish. Lightroom tells me it is too large a file to publish to the web but won’t let me delete it so it sits there in the to publish collection. Win 7 professional 64 bit. so no registration possible. hm, i payed $5 and hoped, the picasaplugin would work like your flickr plugin. what i am doing wrong? Thank You for the heads up. You are wonderful. I won’t be anywhere without you. Jeffrey – Being new to Lightroom, I entered captions for 1000 photos into the Caption metadata field. Only to realize that when I publish to Facebook, the text must be in the Title field to show on Facebook. Do you know of a workaround, including for example an app that would let me copy the data from one field into another in bulk? I have just experienced this bug and I’m getting it frequently now. Anything I can do to help your or Adobe’s investigation? I see that there aren’t any official bug reporting channels you can point us so maybe it’s just a wait and hope situation? In fact (though this may be a different bug) I actually had all my folder appear empty in the Folders list. The Loupe/grid view would continuously say “No photo(s) selected” or something regardless of what I did including turning off filters and restarting Lightroom. It wasn’t until I restarted my Macbook and perhaps fiddled around in the Published Collections modules that the view finally came back. I am experiencing something very similar to what Ben mentioned. Switching between folders and collections seems to work fine, but suddenly, after having visited a published smart collection, the grid is stuck with appears to be the content of the last published smart collection, and regardless of what I do after that, the photos in the grid remains the same. Henrik this is definitely some of the behavior I’m seeing. Sometimes I’m able to get the proper grid view back in the Folders view, other times I have to quite LR to get things to show properly. I upgraded to LR5.2 (non-beta version) and the Publish bug still remains. I posted it on their feedback forum and, apart from being flagged as ‘acknowledged’ the problem remains. I didn’t notice it in LR4, but, like you, it’s consistently there in LR5.3. I justed phoned Adobe support, but their policy is not to help, if it’s a 3rd party plugin. I’ve just tried it in the supplied Flichr plugin and the problem is there too. What is probably an manifestation of this same bug is a selection bug that only happens when viewing the publish grid. The zoom that comes up when you double click a picture is the picture that is selected in the filmstrip. It is NOT the picture that you double click on. So, if you’ve got picture A selected in the filmstrip and double click on picture B in the grid, the zoom image that you get will be picture A. If you single click on the grid picture to highlight it and THEN double click on it, you will get the correct zoom of picture B. This doesn’t happen when using the folders grid or the collections grid, only publish services. It looks like the filmstrip selection isn’t updating fast enough to get picked up for the double click. Anyone else see this one? I’ve given up applying presets in the grid mode because it just doesn’t apply them to the photo I think I’m applying them to. I have found that after I publish to Flickr (the only service I publish to) the preview database is corrupted. I cannot see the images associated with the collections in Gallery mode. I have to delete the previews database which forces Lightroom to rebuild the previews before I can see any of my collections properly. Then everything is hunky dory until I publish again. This is distressing and a pain to deal with. I wonder if anyone else has had this problem? I have two “Published Services” installed in Lightroom 5.3, one for 500px the other for Flickr. I also experience the “Published Services” problem which manifests itself in both 500px and Flickr being highlighted which makes it impossible to switch between them. However, if I double click on the highlighted “Flickr” area to bring up the “Edit Photoset” dialog box, add a space at the end of the name, then re-save it I can change the “Published Photos” focus. When it happens again I change the name again by deleting the space from the name and resave!!!! This bug has returned in Lightroom CC 2015.7 – it was so incredibly frustrating. Selecting what I wanted to work on in the grid would never update the loupe on the 2nd monitor or take effect when moving into Develop module. In my case, restarting LR reset the behavior to normal but I sure would like to know how this mode is even triggered! I have to go back and check what actually happened to my work, since I was working with a “bulk import” from my phone (something rather unusual for me) so I had the metadata preset very generically and my whole purpose of selecting images at the grid was to tweak the location EXIF data. I may have just changed the same image’s metadata 100 times since I didn’t notice the strip selection wasn’t changing. We’ll see – but I wanted to let you know that this has definitely cropped up again.